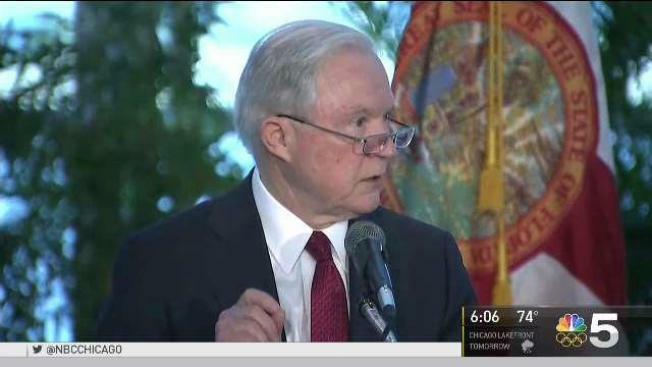 Attorney General Jeff Sessions took aim at Chicago today, as he called out the city's crime rate and bashed Mayor Emanuel for not following federal immigration law. NBC 5's Ash-Har Quraishi has reaction from the accusations. Attorney General Jeff Sessions escalated his attacks on Chicago Wednesday during a speech on "sanctuary policies," a week after the City filed a lawsuit against the U.S. Department of Justice over efforts to block funding to local governments that do not turn undocumented immigrants over to federal authorities. "Respect for the rule of law has broken down. In Chicago, their so-called 'sanctuary' policies are just one sad example," Sessions said, calling sanctuary cities "a trafficker, smuggler, or predator’s best friend." Sessions traveled to Miami-Dade, Florida, to deliver the remarks, which the DOJ said in a release would "take on Chicago political leadership" as he sought to highlight jurisdictions that have "increased their cooperation and information sharing with federal immigration authorities." The term "sanctuary city" refers to cities that do not comply with the federal government's requests to detain undocumented immigrants who have been arrested on charges unrelated to their immigration status and turn them over to U.S. Immigration and Customs Enforcement for possible deportation. The City of Chicago is preparing to sue the Justice Department over its plan to withhold funds from so-called "Sanctuary Cities," cities that shield illegal immigrants from federal authorities. NBC 5's Regina Waldroup has the latest on the suit. In his speech, Sessions drew a direct link between Chicago's violence and the city's "sanctuary" status - a designation that several studies have found is not linked to an increase in crime. "I know that Miami-Dade will be an example of the good that comes from following the law," Sessions said. "We have already seen that: the same Independence Day weekend when Chicago suffered more than 100 shootings and 15 homicides, Miami-Dade also had a historic number of shooting deaths – zero." Sessions' speech, during which he was joined by U.S. Immigration and Customs Enforcement’s acting Director Tom Homan, came nine days after the City of Chicago filed a federal lawsuit against the DOJ, arguing that President Donald Trump’s administration’s bid to withhold public safety grants from sanctuary cities is illegal. 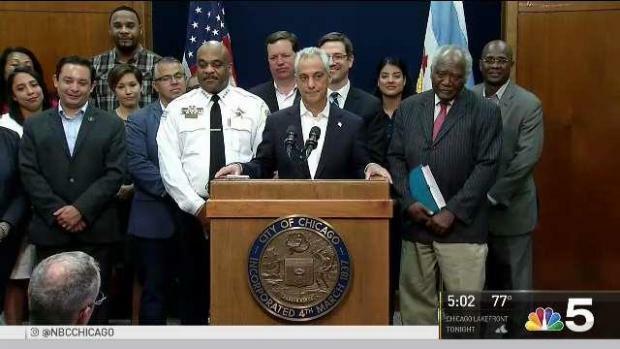 "Chicago will not be blackmailed into changing our values, and we are and will remain a welcoming city," Emanuel said in a statement announcing the suit. "The federal government should be working with cities to provide necessary resources to improve public safety, not concocting new schemes to reduce our crime fighting resources." The City filed the suit after the DOJ released its application for the 2017 Edward Byrne Memorial Justice Assistance Grant (JAG), a program Emanuel said Chicago has used in the past for various public safety initiatives, including the purchase of SWAT equipment, police vehicles, radios and tasers. Last year, the City received $2.3 million in Byrne JAG funding, according to the mayor. However, this year’s application included provisions requiring local governments to allow the U.S. Department of Homeland Security access to any detention facility to meet with and inquire about the citizenship of anyone believed to be undocumented, and to give federal authorities 48 hours advance notice before releasing someone who is wanted on immigration violations, as conditions to receive funding – both changes in the program’s requirements from years past. The city's lawsuit argues that the Justice Department cannot make grants contingent on these requirements because they would "effectively federalize local detention facilities" and violate the Fourth Amendment of the U.S. Constitution in requiring detainees to be held beyond the timeframe in which they would otherwise be eligible for release. The DOJ's shift in requirements is part of the Trump administration’s months-long effort to crack down sanctuary cities. In January, Trump signed an executive order to block federal grants to sanctuary cities, an action that a judge blocked in April, ruling that the president could not set new conditions on spending approved by Congress - an argument included in the City of Chicago's lawsuit. However, Sessions has moved to intensify the crackdown on a number of occasions, most recently sending letters to four cities informing them they would be ineligible to receive resources under a new crime-fighting program unless their police departments show proof of compliance with the DOJ’s new rules. Hours after the suit was filed, Sessions hit back at Emanuel, issuing a statement saying Chicago's leaders have "demonstrated an open hostility to enforcing laws designed to protect law enforcement... and reduce crime," adding that the administration "will not simply give away grant dollars to city governments that proudly violate the rule of law and protect criminal aliens at the expense of public safety." Sessions expanded upon that criticism yet again Wednesday, this time taking it a step further in urging Chicagoans to take action against Emanuel. "So if voters in Chicago are concerned about losing federal grant money: call your mayor," he said, though he declined to discuss Emanuel by name. "Rather than acknowledge soaring murder counts or the heartbreaking stories told by victims’ families, Chicago’s mayor has chosen to sue the federal government." Emanuel has repeatedly defended Chicago’s "Welcoming City" ordinance against these criticisms, and did so again in response to Sessions' remarks. "In a week in which the Trump administration is being forced to answer questions about neo-Nazis, white supremacists, and the KKK, they could not have picked a worse time to resume their attack on the immigrants who see America as a beacon of hope," Emanuel said in a statement, referring to President Trump's widely-criticized comments claiming there was violence "on both sides" of a white supremacist rally in Charlottesville, Virginia. 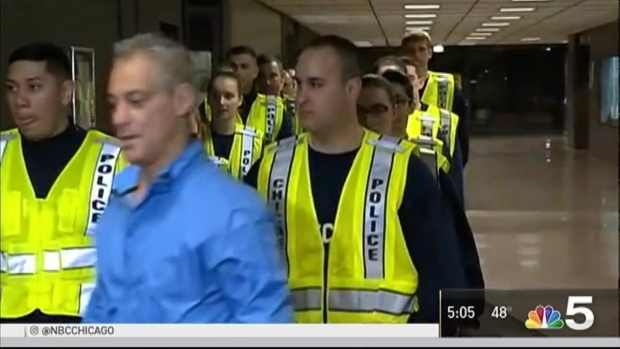 "Chicago will continue to stand up proudly as a welcoming city, and we will not cave to the Trump administration's pressure because they are wrong morally, wrong factually and wrong legally," Emanuel continued. Chicago is not alone in its immigration policies, as more than 200 jurisdictions nationwide have declared sanctuary status, including New York City, Los Angeles and more, with some expected to follow Chicago in filing suit. The city hopes to have a decision on the lawsuit before the Sept. 5 deadline to apply for the grant program, and officials said they do not anticipate the litigation "will cost the city any additional resources."